It’s so easy to set up an account on Facebook or Twitter pretty much anyone can do it. Knowing how to effectively use those sites for business purposes? That’s more complicated. Different social networking sites present different opportunities — and challenges. You can try and figure it out through trial and error. 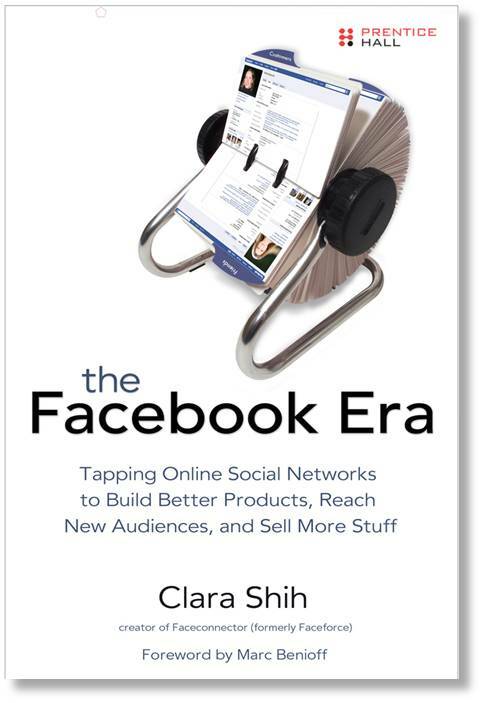 Or, if you prefer to minimize mistakes, read The Facebook Era: Tapping Online Social Networks to Build Better Products, Reach New Audiences, and Sell More Stuff , by Clara Shih. Of course there’s an abundance of books about social media marketing. Why pick this one? Well, few go at it so sharply from a corporate perspective, and fewer still are written by someone who has as much first-hand experience as Shih, who created a successful Facebook business application (Faceconnector). Her highly informative book goes deep with details, to include case studies and a plentitude of screen shots that help make things crystal clear. FYI, the book’s title tells but part of the tale. Sure, it’s full of tips on how to leverage Facebook — still, Shih delves into other social networks, too, as well as associated tools and applications. In fact, it’s an eye-opener in this regard. Shih covers corporate-centric tools like Hoover’s Connect, which helps sales reps understand complex organizational structures, and Yammer, for intra-enterprise microblogging. Much attention is paid to salesforce.com offerings — Shih was working for the company when she wrote the book. If The Facebook Era sometimes feels like an ad for that company, well, so it goes. Shih then breaks down how online networks can be a boon to the sales process. For instance, a sales rep can use LinkedIn to search out qualified leads and mine all kinds of information available on that site in order to prepare sale calls that are personal and relevant to individual prospects. Other sections cover how to leverage social media for recruiting and product innovation, and again, Shih clues you into handy enterprise tools, like Connectbeam, a collaborative platform for building employee expertise profiles. That’s the heart of the matter when it comes to social marketing. Here’s where Facebook takes center stage. Shih shines a bright spotlight on the site, via a step-by-step guide that digs into strategies, best practices, methods of interaction, hypertargeting and more. Shih adds that creating your own app from scratch is risky business. You may be better off with sponsorship opportunities offered by existing apps that are popular with your target audiences. To help determine what these might be Shih conveniently lists Lookery — which provides a directory of ad network publishers, including Facebook apps, with analytics, demographics and other useful data. This is mighty meaty material. Shih covers a tremendous amount of ground detailing how to power-up your business’ social media presence with a clear plan of action. Now, if you want additional info, visit The Facebook Era’s Facebook page. What are your thoughts on The Facebook Era? Have you read the book, too? If so, what’s your take on it? Comments welcome.